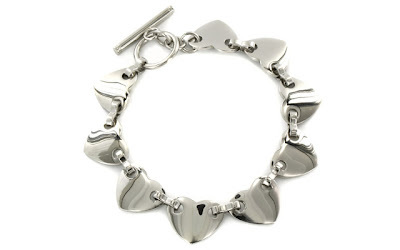 This West Coast Jewelry Heart Link Toggle Bracelet is currently selling for just $18.02 on Wayfair.com! You will be saving 63% off the listed price of $48.95 with this jewelry deal. More about this heart bracelet . . . This item comes with Free Shipping today when your order totals more than $69.00! Many reduced-price items on Wayfair.com are only available in limited quantities, so do not wait too long to take advantage of this discounted price.